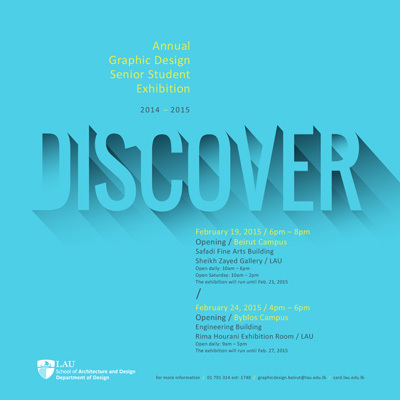 The Department of Design is hosting “DISCOVER,” the annual graphic design senior student exhibition. During the openings the certificate of excellence in graphic design awards will be announced and catalogues featuring students’ work will be distributed. The exhibition will open on February 19 from 6-8 p.m. and will run until February 24. It will be open from 10 a.m. to 6 p.m. on weekdays and from 10 a.m. to 2 p.m. on Saturdays.